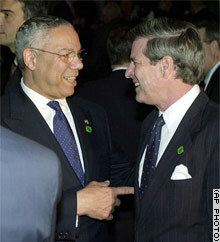 U.S. Secretary of State Colin Powell and L. Paul Bremer, the U.S. civilian administrator for Iraq, talk at a session of the International Donors' Conference in Madrid on Thursday. MADRID, Spain (CNN) -- A top Iraqi official attending an international conference on raising funds to rebuild Iraq warned Thursday that France and Germany's limited donations would not be forgotten. Ayad Allawi, the current head of Iraq's U.S.-appointed governing council, said he hoped German and French officials would reconsider their decision not to boost their contributions beyond funds already pledged through the European Union. "As far as Germany and France are concerned, really, this was a regrettable position they had," Allawi said. "I don't think the Iraqis are going to forget easily that in the hour of need, those countries wanted to neglect Iraq." U.N. Secretary-General Kofi Annan -- also attending the conference -- urged the international community to give billions of dollars to rebuild the nation, saying reconstruction cannot wait until a sovereign Iraqi government is established. Some countries have balked at funding programs in post-war Iraq, citing the go-it-alone approach taken by the United States and Britain ahead of the conflict. Germany, France and Russia -- the chief opponents of war before the U.S. invasion -- sent lower level officials to the conference. Those countries have been opposed to what they see as too much U.S. control of the reconstruction process. The United States has committed $20 billion to the effort. Spanish Economy Minister Rodrigo Rato said last Friday he hoped $15 billion to $20 billion would be raised, but Foreign Minister Ana Palacio told CNN last week that as little as $6 billion could be raised for a trust fund that the World Bank, United Nations and Iraqi authorities would manage. A bomb attack in northern Iraq killed a U.S. soldier Thursday morning, and military officials are investigating the deaths of two troops in Baghdad from causes unrelated to combat, according to U.S. Central Command. In the latest fatal attack on U.S. troops, a soldier from the Army's 4th Infantry division was killed and two were wounded when their convoy was hit by an improvised explosive device about 11:30 a.m. Thursday, a military statement said. The attack occurred in Baquba, about 60 kilometers (38 miles) north of Baghdad -- a region where opposition to the U.S.-led occupation of Iraq runs high. In addition, two soldiers from the Army's 1st Armored Division died on Wednesday in separate noncombat incidents, Central Command said. The first was found "in need of medical attention" in the barracks about 3:50 p.m. Wednesday, Central Command said in a written statement. Medics were called in, but the soldier was pronounced dead at the scene. Another soldier was pronounced dead after collapsing in an "off-duty area" about 9 p.m. Wednesday. The soldier was evacuated to the 28th Combat Support Hospital and was pronounced dead. An Iraqi military policeman walks past a car in which U.S. soldiers found explosives in Baghdad on Thursday. • Retired Army Gen. Tommy Franks, who planned and commanded the U.S.-led wars in Iraq and Afghanistan, told a crowd at a charity event Wednesday night in New York that the United States is in a serious struggle against terrorism, not only within its borders but also in the free world. The former head of Central Command said, "The prize we seek is another 200 plus years of freedom in this country." • An investigation into the August bombing of the U.N. headquarters in Iraq calls for reforms in the way the international body handles security in Baghdad, saying its security system was dysfunctional at the time of the attack that killed 22 people and wounded more than 150 others. In a report issued Wednesday, a panel appointed by Annan said "security awareness ... did not match the hostile environment." The panel recommended that new security arrangements be in place ahead of the return to the Iraqi capital of U.N. staff members, most of whom were moved out of country after the bombing. CNN's Jane Arraf, Al Goodman, Jamie McIntyre, Barbara Starr, Harris Whitbeck, Matthew McFetridge and Mike Mount contributed to this report.